Peter Rabbit is not as awful as its manic marketing campaign seemed to suggest, but that's not exactly a high bar to clear, because this updated adaptation of Beatrix Potter's classic children's books is still not very good. 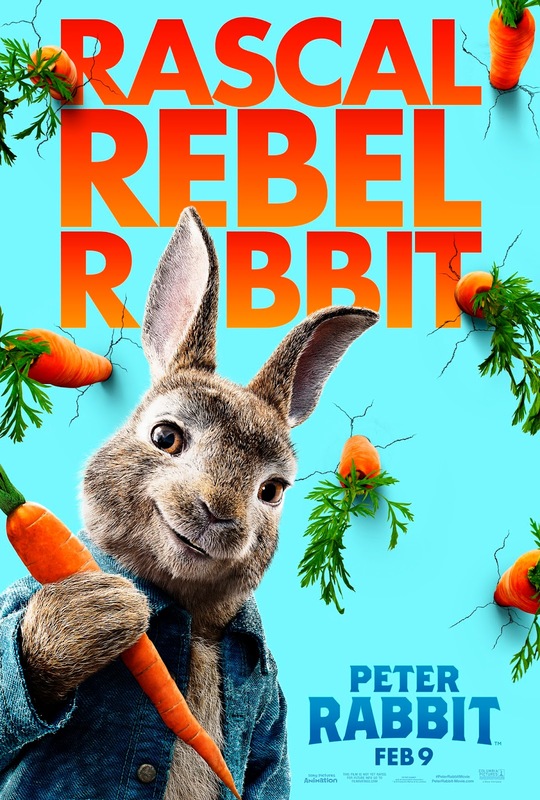 Like so many adaptations of classic children's literature before it, Peter Rabbit falls into the trap of trying to update the concept for more modern, jaded children who apparently need crass slapstick and seemingly never-ending, painfully dated pop songs in order to enjoy them. The basic idea is the same. Mischievous Peter Rabbit (James Corden) is always trying to break into Mr. McGregor's garden, and Mr. McGregor (Sam Neill) does everything in his power to catch and stew the rabbits. It's an age old struggle, one that comes to an abrupt end when old Mr. McGregor has a heart attack and keels over dead at the beginning of the film. Enter his nephew, Thomas McGregor (Domnhall Gleeson), a fussy, high-strung toy company manager who inherits his uncle's country estate, much to his city-loving dismay. The eternal Rabbit/McGregor struggle continues, however, as the new McGregor tries to rid the property of the pesky animals. Things are complicated when McGregor begins to fall in love with the animals' kind-hearted protector, local artist Bea (Rose Byrne). Horrified, Peter and his friends set out to push the couple apart, leading to all out war between McGregor and the animals, who must keep their rivalry secret from their mutual object of affection. There are a few genuine moments of levity here, but the whole enterprise is undercut by its loud, garish style, relying on over-the-top slapstick for its humor rather than anything resembling wit. It is further marred by near-constant use of pop songs that seem like a desperate ploy to grab the attention of young audiences in 2018. It completely negates the timelessness of Potter's work with an aesthetic that will likely seem woefully outdated by next year. Gleeson and Byrne are capable leads, and most of the film's best moments are courtesy of their undeniable chemistry. But why is McGregor treated like such a detestable villain simply for wanting a tidy house? He makes for a good villain for a 7 year old, I suppose, for whom a clean room may seem like the ultimate evil, but he does nothing to warrant the beating that the film puts him through for the pleasure of its young audience. To top it all off, Peter shoots blackberries down McGregor's throat, a food to which he is deathly allergic, and then goes on a rant about how food allergies are ridiculous and "everyone is allergic to something nowadays." It's a shockingly irresponsible treatment of food allergies for a children's film, made even more so for the fact that McGregor's near death use of his epipen is treated as a comic moment. It's moments like that that really define Peter Rabbit. Gone is the simple charm of Potter's lovely drawings, replaced by a rude modern sensibility that feels far removed from its endearing source material. The filmmakers really could have learned something from Paul King's Paddington films, which brought their classic subject into the modern era without ever losing any of its innocence or magic. Some flashes of Potter's classic drawings, which are turned into some lovely animated moments near the film's end, may make audiences yearn for the simplicity of her gentle voice. Instead, we're saddled with this loud, cynical, and ultimately dull reimagining of a classic children's work that seems content to trample all over its inspiration. I'm with McGregor. Kill da wabbit. PETER RABBIT | Directed by Will Gluck | Stars James Corden, Domhnall Gleeson, Rose Byrne, Daisy Ridley, Margot Robbie, Elizabeth Debicki, Sam Neill, Sia, Furler Vauxhall, Jermaine Terenia Edward,s Colin Moody, David Wenham | Rated PG for some rude humor and action | Now playing in theaters everywhere.